The weighted average clearance rate saw further softening last week, with only 42.7 per cent of homes successful at auction… Both volumes and clearance rates continue to track lower each week when compared to the same period last year (2,046 auctions, 61.5 per cent). In Melbourne, final results saw the clearance rate fall last week, with 45.7 per cent of the 266 auctions successful, down from the 48.6 per cent across a significantly higher 1,709 auctions over the week prior. Across Sydney, the final auction clearance rate came in at 42.6 per cent… Sydney’s final clearance rate last week was not only the lowest seen this year, but the lowest the city has seen since December 2008. 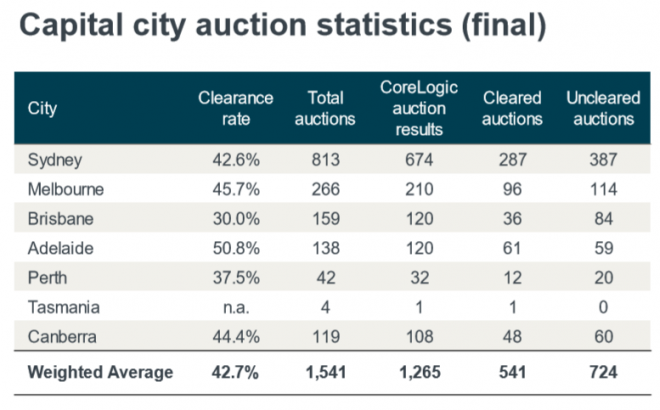 You will also note from the second table above that 143 out of Sydney’s 813 auctions (i.e. 18%) were unreported, whereas 56 out of Melbourne’s 266 (i.e. 21%) were unreported. Presumably many of these were failed auctions, thus suggesting that the true auction clearance rate is even lower. Australia’s housing market continues to weaken. suggesting that the true auction clearance rate is even lower. 35.30% is the lowest it could be for Sydney. Not necessarily – some of those reported sold tend to be duplicates ( ie counted twice with a spelling error in the street name / number) or already reported in previous weeks. Sure but I’m only going off the information and number presented. – Many more properties are getting passed in and are in their 2nd or 3rd auction or are now for sale. I agree with all of that, for sure. Finally we might start to see house prices heading back to some long term average at some point so things can get back to normal and the whole country can wake up, realise it was just a dream (or nightmare depending who you are) and then just get back to some productive work again. The whole housing obsession is way out of control, it’s just a place to live so you can go find a job and do something productive (hopefully but seems hard to find these days in Australia). It is good that most people are holding back selling their place as they know the new boom is about to ramp up. It would be stupid for someone to accept a devalued price that does not accurately reflect the true and much higher price they deserve and will get with a little patience. Ha, trust Reusa not to make a thinly veiled allusion to edging, the hockey-stick shape and its large splurge aftermath – it’s inconceivable! Come on reusachtige, capitulate already. There are lots of bears on MB and a few sceptics and you – the last remaining property bull. It’s all over once you surrender. im glad that you believe in your own stories……………house prices will keep going south for at least the next 3 years!! A veteran real estate agent mentioned that peak to trough might be 30%……….in other words back to 2014 levels!!! I remember lots of moaning about bubble prices back then, I’m quite sure. Do I take this as housing bear capitulation and acceptance of a permanently high plateau? By the way, what does the W stand for? ruesa knows the way the market goes! There is no question that we’re simply experiencing a sideways reset of prices which will give the truly smart money an opportunity to accumulate, consolidate and ameliorate their property holdings and establish who will be in possession of a relations party golden ticket for the next decade. Still funny, reusa, but starting to get a little boring (just a little). How long has it been now, since your alter ego joined the dark side? 5 years? Time for a new metamorphosis, me think. That is a pretty head and shoulders crash chart. It’s fear and panic after next 5 big weeks of auctions. Hey – dont’cha know that the next downturn in auction numbers will be because of holidays season spending? Come on! Get with the program! Good. Let it continue. Only a fool wants high house prices. The higher the house prices the lower the spending power in the non house sectors of the economy! Check out the volume drop in Sydney too. 1230 to 800 in 12 months. Hectic. We’re currently experiencing “loss of containment”…we’ve yet to hit the ignition source. Just a loss of containment…. indeed, hahaha! LVO – what were the % of unreported auctions during the boom time?